Barry Hutchins riding at Yallingup, WA. Photo by: Clay Bryce. 1. How did you come to start making bellyboards? When was the first one? I always had rubber surfoplanes when I was growing up and regularly visited Cronulla Beach with my family. 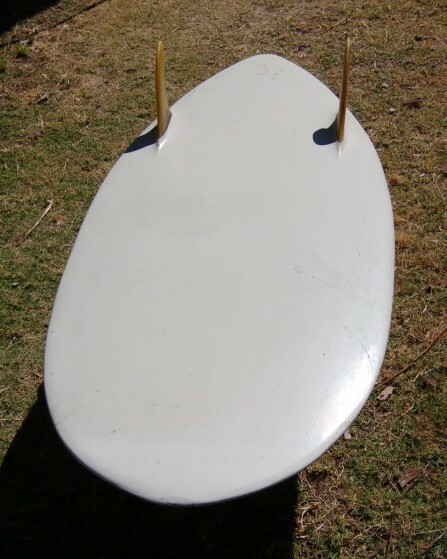 I made my first bellyboard in 1963, after seeing surfers riding them at Cronulla. I was a student at Newington College (at Stanmore near the city) so didn't know any of the locals where I lived (at Caringbah). However, I was forced to leave this school by my mother (the fees were too high) and I spent my last year at Caringbah High where I met a group of body-surfers who surfed at Cronulla Point. Thus in no time, I was a regular there. 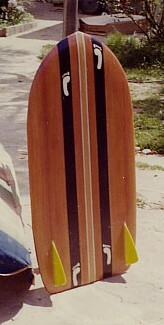 This first board was made (crudely) from plywood and had no fins. It was three feet long. 2. You've mentioned your first board was made from chipboard. How did it ride? Did it last long? This was actually my second board and it replaced the above board when it delaminated. I painted the chipboard, but it still only lasted a few months (started to swell). Once again it had no fins so was not very manoeuvrable. 3. Where did you get the idea of riding bellyboards from? Had you ridden stand-up boards? No, I have never owned a stand-up board although I had given it a go on borrowed boards, but never took to it (also the cost was a factor). Bellyboards seemed a good compromise between body surfing and standup boards. 4. Cronulla is a pretty localised area. What was the reaction of other surfers to you? When I started surfing at Cronulla Point, most of my friends were body surfers. Stand-up surfers hated body surfers and bellyboarders so we tended not to mix. I made my first redwood board on the recommendation of my stepfather (who had built a few sailing dinghies from this wood). The wood came in 12 inch wide planks and 1 inch thick. My stepfather helped me glue and dowel the planks together and showed me how to fibreglass the board after it had been shaped. I bought my supplies from the local surfboard manufacturer (Jacko surfboards) where I hung around picking up tips. I eventually bought a small booklet entitled "How to build surfboards" which helped me a lot. My first redwood board was three foot long and proved popular with some of the body-surfers who asked me to make one for them. After making three or four, my mother suggested that I should advertise in the free ads section of the Sunday Telegraph. This I did and I got so many orders that I had to hire a school friend to help me make them. By this stage, I was supposed to be studying for my Leaving Certificate, but I somehow always managed to be working on boards in the backyard shed instead. I was hoping to get into Vet school at Sydney Uni (my mothers choice), but my marks weren't good enough and so I had to do marine biology at Uni of NSW. However, this was a move strongly supported by me as I had always had a fascination for the ocean (my family moved to Sydney from Griffith where my father had a farm when I was 9). 5. Who was the market for your boards? Most of the people who ordered boards from me were either body surfers or new comers to surfing. A few good friends reordered as I came up with better designs. 6. How long did you make boards for in Sydney? Did you stick with a basic design or was there much evolution? A redwood board would take about a week to complete but I was probably working on more than one at a time (I remember that just before Christmas 1964, I had 8 boards on the go). When I started getting orders for balsa boards, these were usually five feet long and required a redwood stringer for strength. Thus they took longer to build and cost more to purchase (18 pounds versus 12 pounds for the redwood boards). I built one foam bellyboard, but I refused to do any more because of the large amount of wastage (I had to start with a surfboard blank). Altogether I made about forty boards, most of them to order. It all came to an end when I finished my science degree and went into the army (I had been called up for national service in 1966). I served with the infantry in Vietnam where I was wounded, but left Sydney when I returned to Australia in 1971, because of the hostility around at the time to Vietnam vets. I worked on trawlers in Qld before heading to WA for a wedding (a life-changing experience). The long balsa versions of my belly boards were all made to order and I believe the purchasers did use them occasionally for stand up surfing (the first short boards?). The long central fin was the idea of one purchaser, but I soon learnt that it was not highly manoeuvrable so eventually dropped it. I did try triple fins of the high aspect ratio shape, but came to the conclusion that two high aspect fins were enough. Figure Set 1. 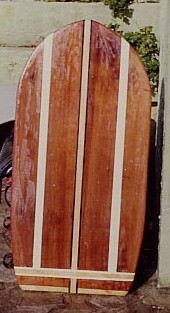 All boards were made from 1 inch redwood in 1965, 4 foot long by 22 inches wide; the white one was my personal board for that year. Regarding evolution, my early three foot redwood boards quickly turned into four foot boards and eventually four foot three inches as the longer boards were much faster. I explained earlier that I tried using a step on the undersurface of the tail but gave this away shortly after. Note the step on the undersurface of the tail. rider at Cronulla Point (1966). 2b. 4 ft redwood, dark blue (1965). pigment coat (to cover up dings). 2d. 5ft balsa board (Xmas 1964). 2f. 4 ft redwood board (Xmas 1964). 2g. 3 ft redwood board (1965). 2e. 5ft balsa board (Xmas 1964). 2h. 3ft redwood board (Xmas 1964). 2i. 5ft balsa board (Xmas 1964). My last four or five boards were all pintails. 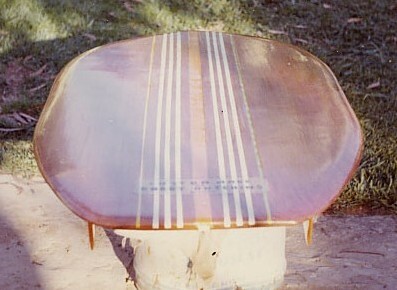 All boards had one layer of 10 oz fibreglass cloth on the undersurface, wrapping around the rails. I made a few with glass on both surfaces but they tended to be too heavy. At one stage, I could not get any redwood planks, but was recommended by the timber yard to try Pacific Maple or Queensland Mahogany. I tried both. The maple was good, almost as light as redwood but the mahogany was a disaster, too difficult to shape and far to heavy. I was embarrassed in having to sell a few boards made from the latter wood. You might have noticed my change in fin shapes, from low aspect to high aspect fins. This occurred in 1965 and made the boards a lot more manoeuvrable. Figure Set 3. 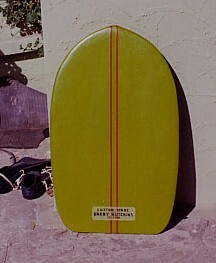 Barry's personal board built in 1966 from 1 inch redwood. Regarding my riding style, I always tried to keep my weight forward as this stopped the tail of the board dragging in the water and maximized speed. However, it required it careful observation of the wave as too much weight on the nose of the board in the wrong section of the wave often led to a nosedive. You may have noticed on several boards that I used a tail shape that incorporated a step in the surface. This was supposed to reduce the wetted area when the rider moved his weight forward. However, I never convinced myself that it was worth the effort and stopped incorporating it in later boards. 7. Where have you surfed your boards? Any particular surfs or waves stand out? 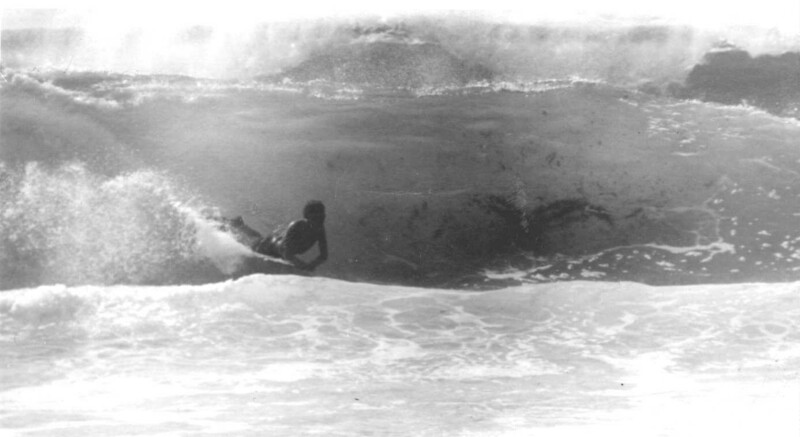 Was Shark Island surfed much in the 60s? I have surfed most locations on the south coast of NSW and when working on a farm in Victoria (during Uni vacation), surfed at Torquay and Bells Beach. I surfed a few areas on the north coastal beaches of Sydney, but spent a fabulous week at Crescent Head in 1966 (made enemies with many of the standup surfers by taking off way too far inside). Shark Island was surfed occasionally on big days when the waves broke a bit further off the rocks, but a number of my friends wiped out on the reef and ended up in hospital so we tended to stick to the point break. Another favourite spot on big days was Voodoo near Kurnell. When I moved to Perth in 1972, I quickly found that the local beaches only had small waves due to the shallow offshore reefs. However, the conditions in the Margaret River and Yallingup areas were some of the best in Australia. I made numerous trips down there to surf, but had a momentous wipeout in 1974, at Yallingup going right, and was trapped under a reef for far too long. This made me look at surfing from a new perspective and resulted in me hanging up my bellyboard for about ten years. Instead I concentrated on scuba-diving and snorkelling, and except for a two year period riding waveskis, I have not returned to surfing. 8. What sort of surfing/waves were your boards built for? I tended to build my boards for the big waves that were common at Cronulla Point. 9. 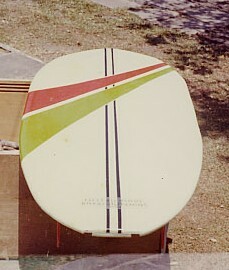 When you moved to West Australia in 1972, did you continue making boards? 10. Do you think a different board is required to surf Western Australia compared to Sydney? If so, what sort of shape/design is required. The big waves down south are perfect for the big wave boards of NSW, but around Perth, the light boogie board is far superior. There are some big wave areas at Rottnest Island, but I have only surfed them once with a bellyboard. Since I gave up surfing, I have become a devoted sailor, having first started in 1963 when I built a sailing plywood surfboard (12 ft), but didn't get serious until the 1980's when I bought a 14 ft surf cat, then an offshore 6 meter surf cat that I used as a dive boat, then a 7.2 meter trimaran that I bought in Qld and towed back to Perth on its trailer, then a 10 meter cruising catamaran and now I have a 10.5 meter catamaran that I built between 2003 and 2007 (see attached pic). I still sail every week, mostly at Rottnest Island, but I have plans to sail further afield (I have previously done trips to the Abrolhos Islands and Shark Bay). Now that I am retired (and on an army invalid pension), I have plenty of time up my sleeve. I could probably take up bellyboarding again but it would always take a back seat to sailing and diving. Surfing at Garie Beach, south of Cronulla, probably in 1965.